Abby will be entering her second year on staff as a Senior, and will be leading The Central Trend staff as one of the two Editors in Chief. 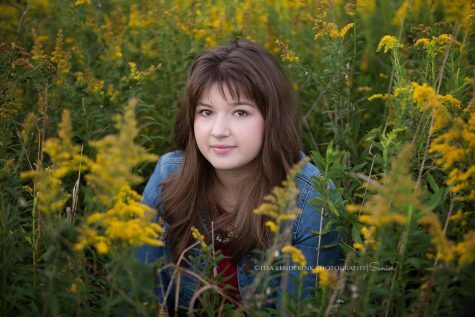 In the near feature, Abby hopes to earn a degree in her strong passion of journalism, but also take place in a pre-medical program at the college she attends within the next year, as she does have a strong interest in pediatric care. After overcoming a ligament injury during the summer, Abby hopes to be back in the saddle riding her horse, Rudy, and competitively showing him in the Lake Effect Horse Shows this upcoming year. While attending college, she hopes to earn a spot on her college’s equestrian team to continue improving her riding skills and explore her passion in a more competitive environment. Throughout the summer, Abby volunteers her time to work with preschoolers and kindergarteners at her church, where she participates in youth group year round. Abby has had the opportunity to join many hiking trips with her church including to the Great Smoky Mountains and many areas in the Upper Peninsula. Favorite book and why: The Martian by Andy Weir because of the incredible detail the story is written in. The author created the story to feel so realistic, yet the situation of the main character being left behind on Mars is too out there for it to be happening in today’s world. However, the story itself leaves the reader at the edge of their seat through every page.